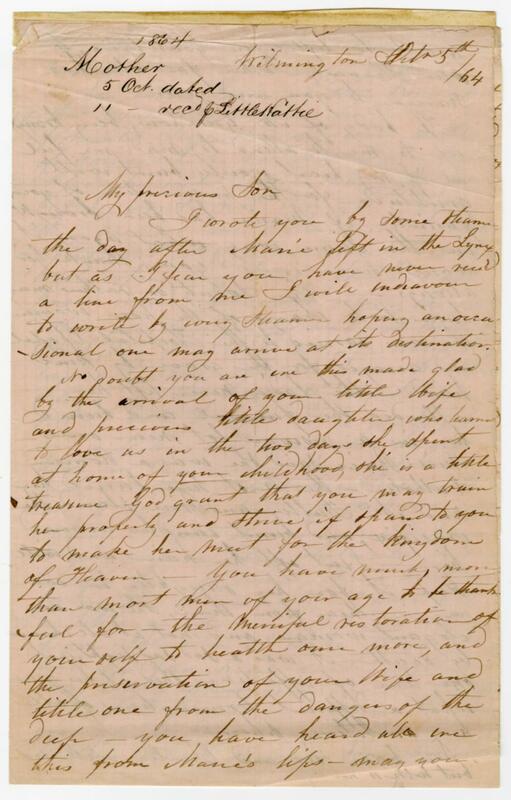 Item Description: Letter dated 5 October 1864 written by Eliza Jane Lord DeRosset to her son, Louis Henry. 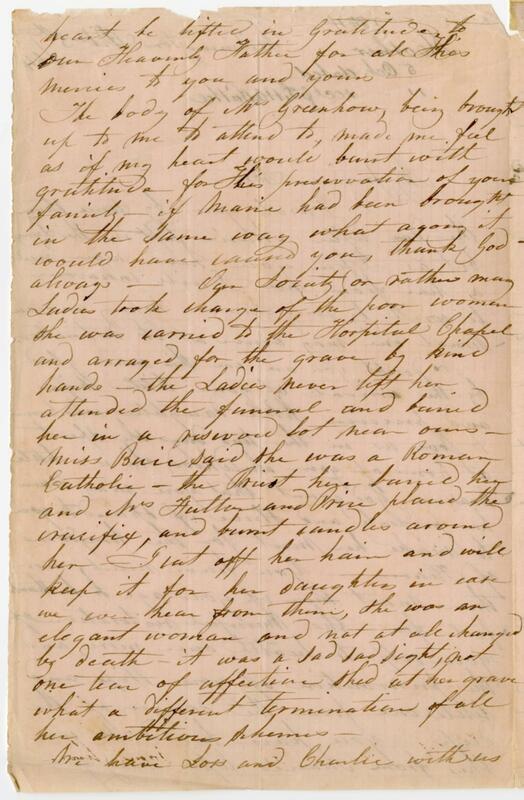 I wrote you some steamer the day after Marie left in the Lynx but as I fear you have never received a line from me I will endeavor to write by every Steamer hoping an occasional one may arrive at its destination. No doubt you are one this made glad by the arrival of your little wife and precious little daughter who learned to love us in the two days she spent at home of your childhood. She is a little treasure God grant that you may train her properly and strive if ? and to you to make her meet for for the kingdom of Heaven– You have much more than most men of your age to be thankful for– the merciful restoration of yourself to health once more, and the preservation of your Wife and little one from the dangers of the deep — you have heard who in this from Marie’s life– may your heart be lifted in gratitude to our Heavenly Father for all his mercies to you and yours. is looking very wretched. I hope this change may benefit her. We heard a day or two ago of Willie London being badly wounded though the chest just escaping the lung, came out his back shattering his shoulder blade- John R went for him and I hope he is at home on this we have not heard of any other of our boys- hope they are all safe. Our town is very ? and every body there about out fight in the rally- the report here yesterday was that Petersburg had been evacuated but so far that is not here, we are hoping great things from Georgia Beauregard has taken command out there– I saw ? ? today just from S.C. says the fever is very bad in Charleston he did not venture in the City– Pa invited a McBloom, I think one of ? clerks, to stay with us while here he says there is very little fever in the City, there have been a good many cases at Smith? most of them fatal. We hear Mr Brown is looking remarkably well and enjoying himself hunting ? while Pa’ and Brother are doing all the work– I trust that won’t last long– Please don’t let that precious little baby forget us but talk to her often of Bonnie, God bless you my son. Mother. This entry was posted in Southern Historical Collection and tagged burial, Charleston, DeRosset family, illness, Wilmington (NC). Bookmark the permalink. 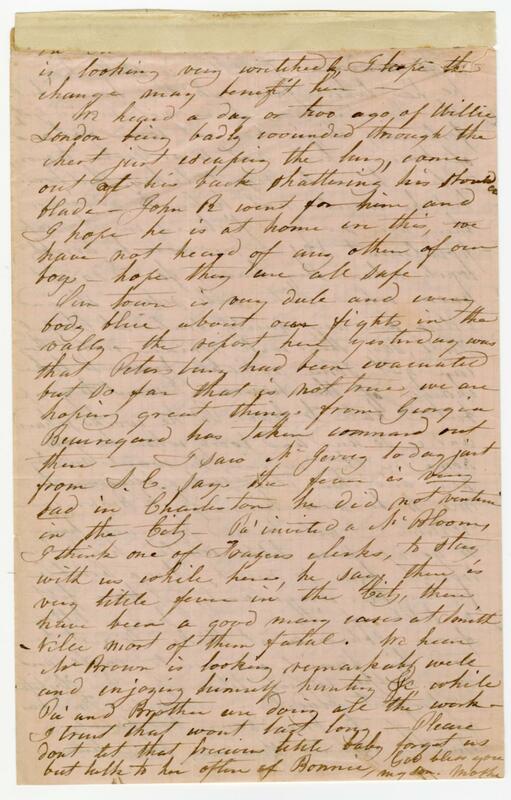 Henry refers to Mr. Greenhow in the third paragraph in the typescript. I believe this was MRS Rose O’N Greenhow’s burial preparations and funeral – a well-known individual in Civil War history and Wilmington history. 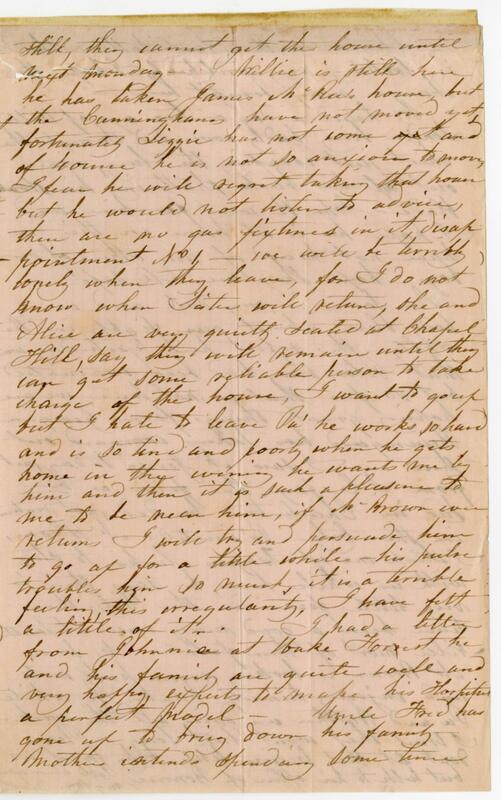 I do not have a copy of her biography on hand to see if this letter was used and correctly identified. Thank you for providing some context!